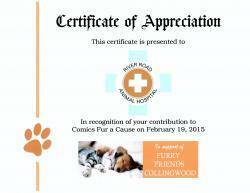 Comics Fur a Cause was a great success, raising $17,000 for Furry Friends Animal Shelter. The event showcased ten comics performing live in front of a sold-out audience. In early December, Furry Friends thrift shop was robbed, which thwarted opening for sales for the Christmas season. A group of volunteers, community members and volunteers got together and planned this wonderful event to raise funds in order to replace lost money, items and sales they would have made during that time. Thanks to everyone who helped put together and support this great cause.